I always have something I really, really, really, really want. Don't you? I really wanted a pair of olive skinnies. Got them. I really wanted a pair of cobalt shorts. Gotcha. I really wanted a striped skirt. Got that too. Coming into Autumn (no, come back Summer!) 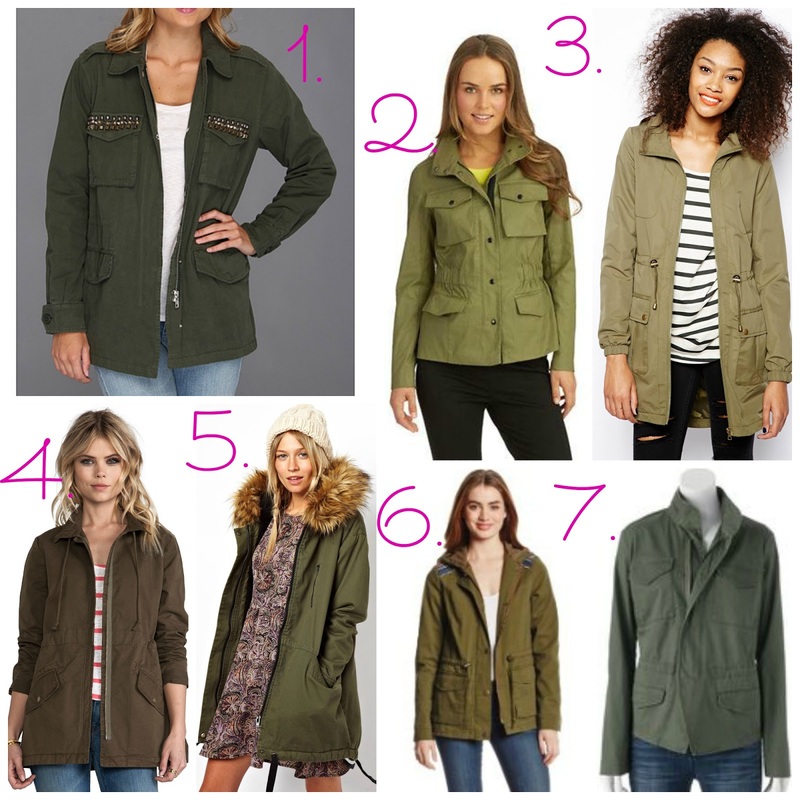 it's no surprise the next thing on my must-have-or-I'm-going-to-pout-like-a-child list is an army green jacket. or an olive jacket. or a utility jacket. whatever you want to call it, as long as it's in my closet asap, I care not. But I can't find one. Not one that I love, in my price range, in my size. But I will. Mark my words, I will. Here are some options, none are 'the one' for me but maybe they will be for you? I really like number 3 but that's just a bit more than I'd like to pay right now, I know it's not bad for a jacket at all and it's probably great quality cause its ASOS but with Boston coming up.. maybe it will go on sale! What do you think? Am I crazy or is this the perfect addition to my closet? I reallllllly want summer to stay around for another month or so, pretty please. I think you will rock the heck out of any Army jacket, lady. I love the 6th and 8th one, on the models. Those are my faves! 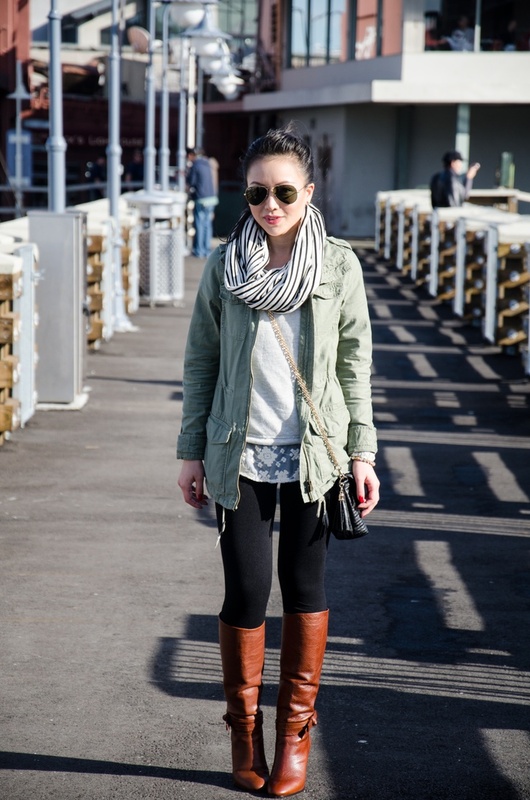 I'm still looking for a pair of olive skinnies!! 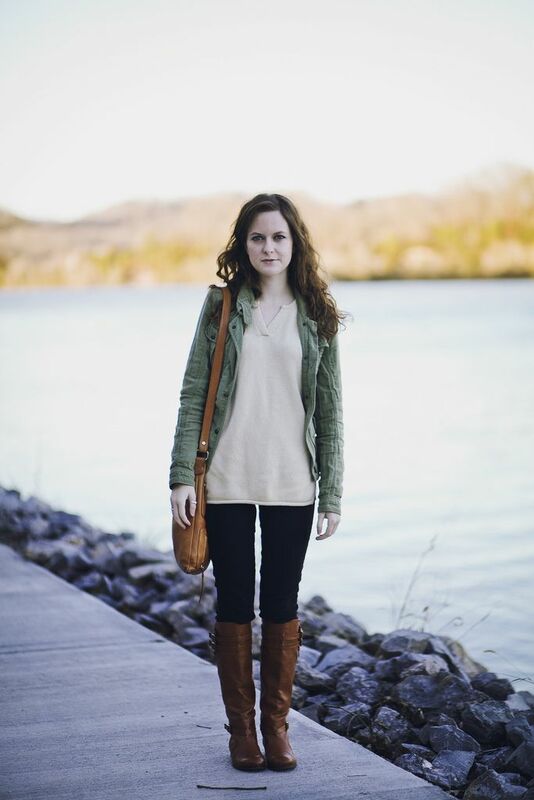 I love the look of this utility jacket and love all the inspiration photos that you found!! I'm sure you're going to rock this look! I totally love the military style jackets but yes the perfect color and fit is hard to find! Id like a pair of olive skinnies too! I have a green utility jacket but I dont like it too much, it feels a little too bulky (and I live in Florida so that doesn't help). But they always look so cute and dainty on the fashion models, so I would like a lighter one! That jacket is perfect!! You can totally rock it!! i want one too! i've been wearing an olive button up, well unbuttoned, trying to pass it off as a jacket, but i just need to get one! Love these jackets! So much outfit inspiration here! I want one, too! So pretty! Ahh now I'm ready for fall! I love all of the outfits and the boots. All of the boots. I would never have thought to pair that jacket with the black dress in scarf?! What a cute look!!!!! I really like those jackets too. They are always a great look and never really go out of style. I hear you on finding one that fits in your budget. I am always really wanting something too! I have 2 of those jackets and 1 with leather sleeves that I live in them durring the fall! #4 is cute, and the price cut is insane!! Pretty sure I need an army green jacket and a leopard print scarf asap! So cute!! Also, I hope you got some points, I signed up using your JustFab link last night!! Got some boots and a purse! Woohoo! 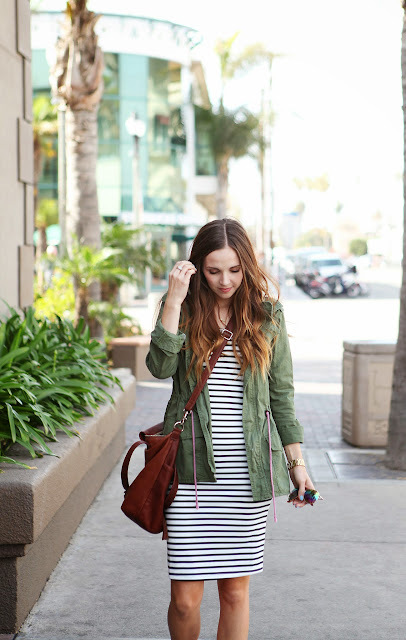 Not crazy, I love slouchy army green jackets. They look so cute over skinny jeans or dresses. Do it! And post where you end up buying. Ive always loved army green and those jackets are the best! I love them! I love number 7! No advice on where to buy one but I really like the jacket. #3 clicks the most for me too. Hope you find "the one"!! Those are great. I always like how they look on other people, but since I'm in the military, I can never buy military-style clothing myself XD. I already have enough military gear, I want to stay far away from it when I don't have to wear it. But I think it looks really cute on others. #5 - I wanna wrap up in that coat!! They have it in black - that would be awesome for winter. Alas, I am po'. such a cute look! Love the coat and the boots! so pretty on you. I really like the olive green color! I think the first jacket is the most feminine! I used to HATE army green & now I'm obsessed with it. I got my utility jacket at Gap this spring (on MAJOR sale) and I have seriously worn it once a week since! I have that 1st picture pinned and recreated that outfit for work a few weeks ago. Um yes!! 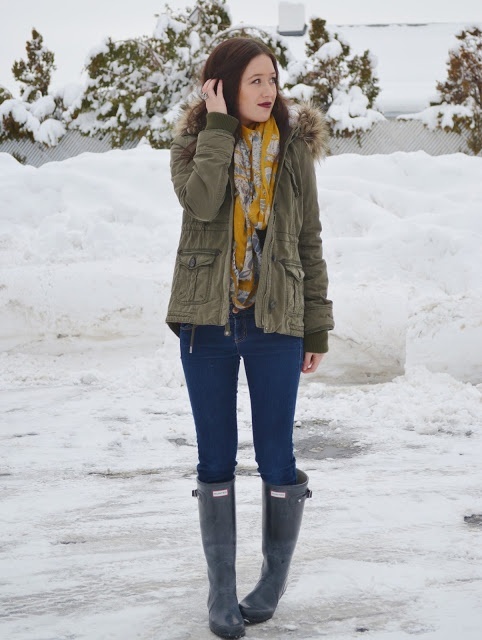 Love me some utility jackets! I got one last year with leather sleeves and I can't wait to bust it out again and I got a vest version over the weekend! So excited to style it! Happy Friday!!! I got one from F21 last season and I seriously wore it all the time! Totally go for it! I like them all but the color of number 1 looks better on me. I am with you, I'm not ready for winter yet and it's a good thing since I live in AZ!! It is still triple digits through Oct. Usually cools off around Halloween. No you definitely need one of these!! I have two and wear them nonstop. Even throughout the summer I've worn my lighter one. It's a must have! I love #2! Now I want to get this! I may just have to help you find the perfect one! I want a pair of olive skinnies so bad this year too! A few years ago I got an army jacket from h&m-- I didn't think anything of it, but it's one of those things that I still wear and always get compliments on it! yesss this is me too! but i can't find one either. i bought one on super sale from Nordstrom (it was like, $25) and it was way too long for me. ugh, short people problems. hope you find the perfect jacket! I did not even know I wanted an army green jacket until I read this!! Can't wait to see what you end up with. Love the way it's paired with skinnies and looks sort of chic when all you gotta do is roll out of bed and throw it on! I love the one that the girl with the red hunters is wearing. Love!! Get yourself one girl! I have the J. Crew downtown field jacket in olive...which is kind of like these but different...and now I want one of these too :( Love! I miss fall weather...I feel like it never happens in Texas. You're not crazy - love this!! Yes! We both need one!